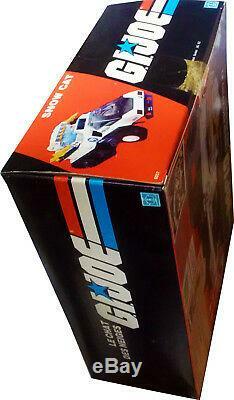 Joe Snow Cat - Vintage 1986 - Collectible. Mint in Sealed Box - MISB! Canadian Residents: Add 5% GST, 13% or 15% HST as Applicable in your Province. Win multiple auctions & we will combine items. This half track mobilization unit plows through blizzard and towering glaciers to trail Cobra into the snowiest regions of the world. 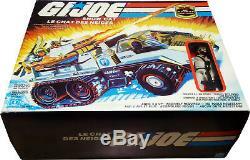 Its part of the new modern Army GI Joe collection of vehicles, weapons, figures, and accessories. Use it to help GI Joe defend democracy and battle his evil enemies. This vehicle carries up to 10 G. Mint in Sealed Box - MISB!! 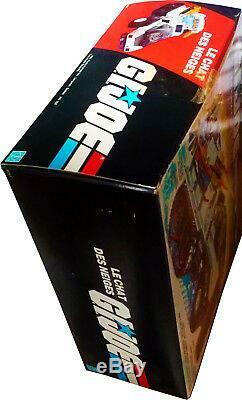 Is in it's Original Factory Retail Box. Actual item shown in picture. It Has Never Been Opened. The item is factory sealed with the original tape on both sides. See all pictures for condition. The colors are vibrant and unfaded. Actual item is shown in picture. It Has Never Been Opened or Displayed! Imported By: Hasbro Canada Inc. Package Includes: Contains: Body, chassis, 2 tracks, 2 tires, engine cover, rear panel, missile box top, 2 wheel covers, front and rear missile supports, 4 missiles, 4 torpedo halves, canopy, 2 headlight lenses, one roof light lens, steering wheel, vent, windshield wiper, 2 rollers, 2 skis, fender flares, GI Joe figure, instructions, and label sheet. Detailed blueprints inside explain fully how were real Snow Cat would operate. Add them to your GI Joe command file. Figure Included: Code Name: Frostbite, Snow Cat Driver, File Name Seward, Farley S. The environment he works in is too unforgiving. If his Snow Cat throws a piston, he's got to step out into the weather that'll freeze a hex wrench to bare skin in 5 seconds and carry through repair job that would be taxing under ideal conditions. He can't afford to panic. Not if he wants to stay alive. Excessive force is not necessary. Adult supervision may be necessary for younger children. Desire for this Rare Collectible! 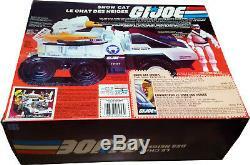 Joe Snow Cat Vintage 1986 Collectible. Mint in Sealed Box" is in sale since Saturday, August 25, 2018. This item is in the category "Toys & Hobbies\Action Figures\Military & Adventure". The seller is "telecommandercorp" and is located in Niagara Falls, New York. Recommended Age Range: 5 and Up.